​KUALA LUMPUR: Putting the nation before personal or political interests, Malaysians must act charitably and constructively for the good of the country, Malaysian bishops said today. In calling on Malaysians to build interracial and interreligious respect and trust, the Catholic Bishops Conference of Malaysia said patriotic citizens had to speak out against ills in society. In an Independence Day and Malaysia Day message, the bishops said racially and religiously motivated forms of polarisation must not be allowed to grow. The bishops called on lawmakers, civil leaders and those who implement the law to uphold the principles of the Rukun Negara and the Federal Constitution, according to a report in Malay Mail Online. “For us as citizens, the spirit of patriotism and love for our country must impel us to speak out courageously against the ills besetting our country and to make sacrifices when called upon. We must act charitably and constructively for the good of our country,” they said. They also called on the government to carry out its obligation with a greater sense of accountability, transparency and integrity amid various problems affecting the nation and that require urgent action, according to the report. The bishops listed issues such as the National Security Council Act 2016, the country’s financial situation, loss of jobs and government wastages as among problems that needed to be tackled immediately. The report said the bishops also reminded leaders that a nation’s strength was determined by how it treated the weakest members of society such as the poor, unemployed and those struggling with disabilities. “Money must serve, not rule,” they said, according to the Malay Mail Online report. The message was signed by the Archbishop of Kuala Lumpur Julian Leow Being Kim, who is also president of the Catholic Bishops’ Conference of Malaysia on behalf of the Archbishop of Kuching John Ha, the Archbishop of Kota Kinabalu John Wong, the Bishop of Penang Sebastian Francis, the Bishop of the Malacca-Johor diocese Bernard Paul, the Bishop of Keningau Cornelius Piong, the Bishop of Sandakan Julius Dusin Gitom, the Bishop of Miri Richard Ng and the Bishop of Sibu Joseph Hii. ​JOHOR BAHRU: Chief Minister Datuk Patinggi Tan Sri Adenan Satem has defended Sarawak’s stand to issue a moratorium on work permit applications of Petronas personnel outside the state, by stressing that Sarawakians must be given priority in the corporation’s operations in the state. 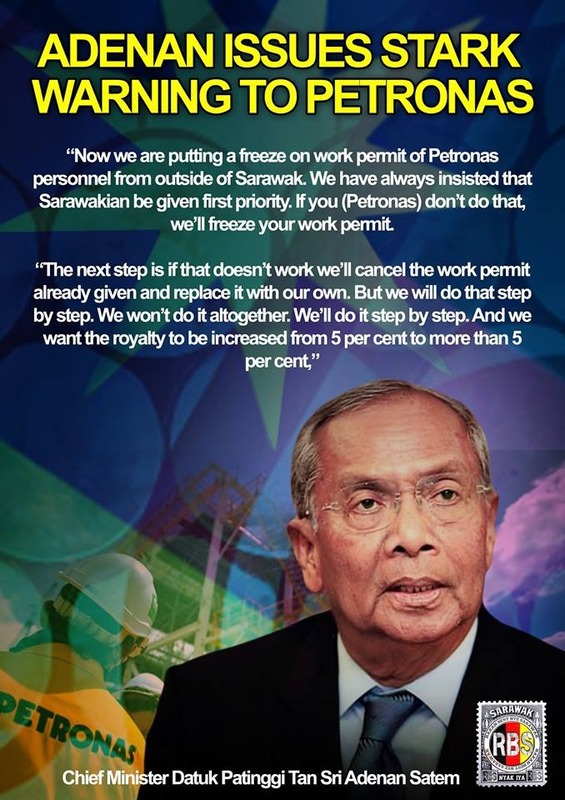 In his first public statement on the controversy surrounding Petronas’ recruitment policies in Sarawak, he even warned that the Sarawak government may even cancel the work permits already approved to the Petronas personnel. “Now we are putting a freeze on work permit of Petronas personnel from outside of Sarawak. 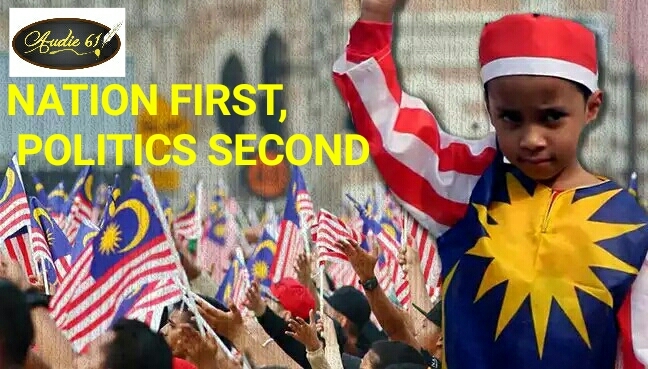 We have always insisted that Sarawakian be given first priority. If you (Petronas) don’t do that, we’ll freeze your work permit. “The next step is if that doesn’t work we’ll cancel the work permit already given and replace it with our own. But we will do that step by step. We won’t do it altogether. We’ll do it step by step. And we want the royalty to be increased from 5 per cent to more than 5 per cent,” he said. Adenan made these remarks at the dinner with Anak-Anak Sarawak at a leading hotel here last night (Aug 12). The Sarawak government and Petronas will meet on Monday (Aug 15) here to discuss the national oil corporation’s recruitment practices in Sarawak. Deputy Chief Minister Datuk Amar Douglas Uggah and State Secretary (SS) Tan Sri Datuk Amar Mohd Morshidi Abdul Ghani will represent the state government in the talk to find out the recruitment and retrenchment practices of Petronas regarding Sarawakians. After that, they are scheduled to meet the chief minister. The issue of Petronas’ preference for Peninsular Malaysians over Sarawakians for jobs in the state has recently been widely highlighted in the media. The issue was raised when Suarah Petroleum Group (SPG) revealed that Petronas in a restructuring process had abolished 29 permanent positions which resulted in the retrenchment of 13 experienced staff from Sarawak. Since then, leaders across the political divide have urged the State Government to act fast to stop workers from other states from working here, prompting Uggah to issue a statement that a moratorium would be imposed with immediate effect on all new applications for work permit by Petronas personnel from outside Sarawak intending to work here.